Spock and Joe Tormolen beam down to planet Psi 2000 to pick up a research party before the planet disintegrates. They find everyone has died, frozen when life support was turned off. Even stranger, the positions of the researcher's bodies show they were out of their minds when they perished and some died by suicide. Unknowingly, Tormolen carried what is later termed the "Psi 2000" virus, back to the U.S.S. Enterprise and it spreads among the crew at an alarming rate, reaching into their souls and pulling out their deepest desires for public display. The virus is water borne and spread by perspiration in a touch. While trying to stop Tormolen from killing himself, Sulu and Kevin Riley are infected with the virus. The crew begin displaying actions that are humorous exaggerations of their desires, like Sulu threatening the bridge with a fencing foil and Kirk becoming overly romantic toward the crew. Others are more heart-wrenching, like Christine Chapel admitting her love for Spock and the Vulcan finally weeping over his mother's death. The deadliest result, however, is when Riley declares himself captain of the U.S.S. Enterprise and locks himself in Engineering. Unfortunately, he also locks everyone else out. Once in command of the ship's engines, Riley shuts them down and the U.S.S. Enterprise is pulled toward Psi 2000 by its erratic gravity. 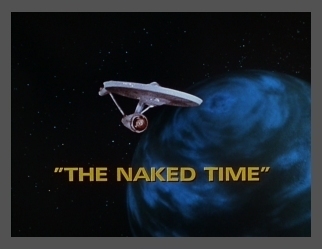 McCoy finds an antidote for the virus which he, fortunately, manages to avoid coming down with, and infects the crew. Anyone who's Irish will enjoy this one! Riley sings! Well, sort of. I agree completely, Captain Kirk! losing command of his ship.